The fourth and final season of Star Wars Rebels, the animated series from Lucasfilm and Disney XD, hits blu-ray and DVD this week. Rebels was the first major release that was produced by Lucasfilm after it was purchased by Disney in 2012, so this release of its final season marks the end of an era of sorts (or, at least, the beginning of the end of an era that will truly wrap up with the release of Episode IX in theaters next year). With that in mind, the season four blu-ray is definitely the best home media release that the series has produced, especially when it comes to bonus features. Season four mostly focused its action on the planet Lothal, where the series began and spent most its first season, giving the proceedings the feeling of coming full circle. It's not without its bumps in the road (lookin' at you "Crawler Commandeers"), but it largely succeeds in its efforts to bring Rebels to a satisfying conclusion. The feeling of finality hangs over the entire season, especially the back half, taking the series to some darker places and dealing with the more mature themes of the nature of sacrifice and loss. The series finale does an excellent job at both situating the events on Lothal within the larger Star Wars universe, as well as bringing the story to a (mostly) self-contained and meaningful end. The season also marked the first time the main villains from the previous season carried over, with our heroes once again going up against Grand Admiral Thrawn and Governor Arihnda Pryce. It also brought back familiar heroes like Captain Rex, Hondo Ohnaka, and Ahsoka Tano to join the fight alongside the crew of The Ghost. Season four also features a pair of guest stars reprising their roles from the live action films. Academy Award winner and Rogue One star Forest Whitaker returns as Saw Gerrera for a pair of episodes, and Star Wars legend Ian McDiarmid lends his voice to Darth Sidious/Emperor Palpatine for the series finale. The bonus features included on the blu-ray are excellent, very much picking up where the season three blu-ray left off. There are three featurettes and six episode commentaries from series co-creator and executive producer Dave Filoni. Two of the featurettes ("Ghost of Legend" and "Forces of Rebellion") could arguably be called mini-documentaries, as they take a larger look at the series as a whole. They cover the evolution of the characters and how the series handled its explorations of the Force, respectively, over four seasons. While there is certainly insight to be found in these, I would have liked them to go a little bit deeper and cover more of the thought process behind some of the choices made. Nevertheless, they are entertaining (and are the sort of thing I would have killed for on the season two blu-ray, which had practically no special features). The third featurette, titled "Kevin Kiner: The Rebel Symphony", is excellent. It focuses, unsurprisingly, on series composer Kevin Kiner, as well as his son Sean, as they take fans through an break-down of several musical moments from across the series, including Ahsoka's showdown with Darth Vader in season two, Sabine's training with the darksaber in season three, and the final moments of "Jedi Night" in season four. If there's one complaint to be made about this one it's that I wish it could have been longer and we could have heard more from the Kiners about additional musical moments. There are six episode commentaries with Dave Filoni on this box set, specifically for the episodes "Heroes of Mandalore Parts 1 & 2," "Jedi Night," "Wolves and a Door," "A World Between Worlds," and "Family Reunion and Farewell." For fans of Rebels, these alone are worth the price of the blu-ray. Filoni walks the audience through the episodes, offering his insight into the writing, the characters’ motivations, and their place within in the larger story of Rebels and the Star Wars saga in general. Having honed his craft under the tutelage of George Lucas on Star Wars: The Clone Wars, Filoni is truly a master of Star Wars storytelling, so any opportunity to hear him go in depth on one of his creations is something fans should celebrate. Overall, the Star Wars Rebels Season Four Blu-ray represents the best of what the series has to offer, both in terms of episodes (the season is arguably the series' strongest) and bonus features. 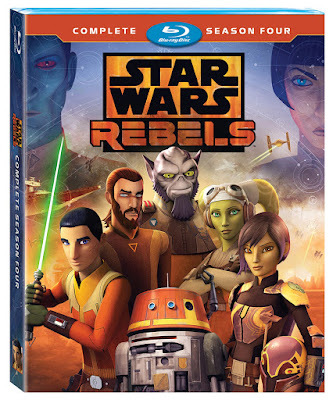 The features included are the best that have ever been produced for a Rebels blu-ray, making this release a fitting final offering to fans of the series. Check out my reviews of the blu-rays for Season One, Season Two, and Season Three. Anyone know where to get the Blu Ray in the UK? When seeing that Zahns cover I am amazed how much I crave more Anakin byy Hayden!